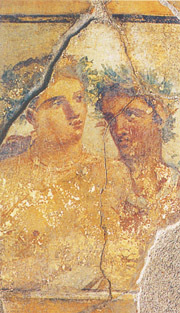 The tour of Pompeii and Herculaneum is the typical archaeological visit in the area of Naples. The ruins of Pompeii are located about 30 km from Naples and 20 km from Sorrento and it is the most visited monument in Italy. The guided tour takes about 2 hours. It begins with the great Forum with its imposing temples to proceed with stores, shops, spa facilities, with fascinating patrician homes with their frescoes and mosaics. No to be missed are also the impressive plaster casts of bodies of victims of the tragic eruption in 79 AD. The name of Herculaneum comes from the legendary founding of the town from Hercules, attracted by the beauty of the place. Probably it was founded by Greeks during the VIII century. BC. Thanks to the beauty of the area and its mild climate, the town became one of the most beautiful residential localities of the Roman patricians who built homes - including the so-called Villa of the Papyri, one of the largest of antiquity. The terrible eruption of Vesuvius, 24 August 79 AD buried suddenly and for ever the town. In 1709 first discovery of the buried town took place even though the systematic excavations began three decades after the will of Charles III of Bourbon, who had also built around the excavations a residence, the Palace of Portici. The wonders that emerge from excavations and the fascination exerted by Vesuvius made Herculaneum a destination for scholars, writers and wealthy tourists who inserted it among the most popular stages of the Grand Tour of Europe. Today Herculaneum is well known all over the world. THIS IS A GUIDED TOUR WITH PRICES BASED ON THE NUMBER OF PEOPLE TRAVELLING IN YOUR PARTY! Clean, cut and boil the thistles. Boil eggs. Put in a pan Liquamen and oil, mesh and boil. Put the thistles in the sauce and cut eggs over it. Cover and leave it marinate for half an hour, without boiling. Serve hot. *It’s possible to use artichoke instead of thistles.